Congratulations! 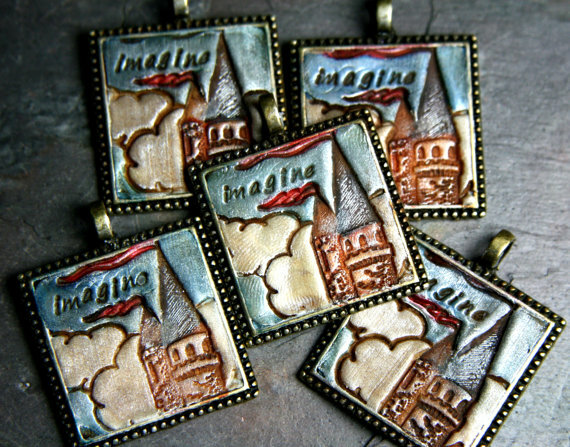 You have won a ceramic house button from Tari Sasser of Creative Impressions in Clay. 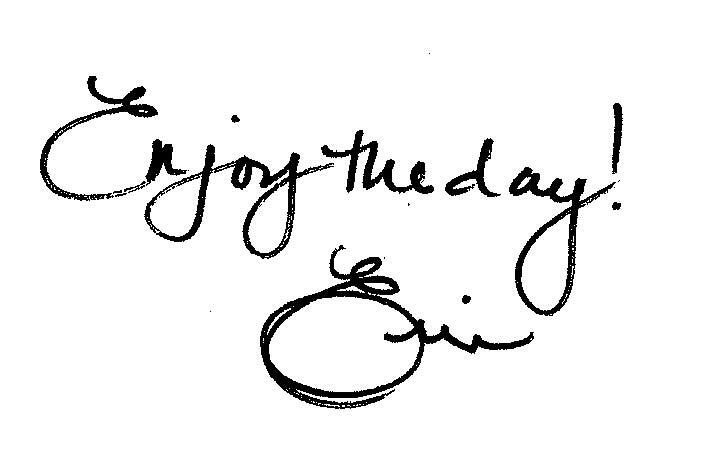 Send Tari an e-mail with your address and she will get it out to you as soon as possible! Erin Prais-Hintz of Tesori Trovati Jewelry. No one else can speak the words on your lips. This month has been all about the story for me. I am honored that the sweet ladies at Vintaj chose me to represent their May theme of 'storybook' for their monthly Art Bead Partnership. Vintaj has been important to me in telling my own creative story and this month has been such a delight for me! 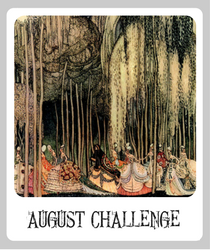 To wrap up this fairy-tale-come-true for me, and to keep to the theme of this month with my quarterly Challenge of Literature (there are 34 really talented people playing with me to reveal their literature inspired creations on a blog hop on May 31st! ), I thought I should do something a bit fun. So I started a with progressive story starter on my blog post here, and invited my readers to add to the story, line by line, in the comments. Not only are there some incredibly creative jewelry designers, but there are some skilled storytellers as well! So far there are magic hats, and quilts and keys... dragons and owls and fairies... a princess named Angelina and a Lady Erina ;-)... a castle on the edge of a forest in Wisconsin... and all sorts of creative twists and turns. The comments on this post will be open just through today, Saturday, May 12th. To sweeten the deal to entice you to comment, I am giving away a very special prize on my blog to a random comment on this post. Want to know what it is? Go and check it out! There is no limit on the number of comments you can leave, the only rule is that you have to keep the story going! Next week I will see if I can pull all the comments and compile the story including writing my own happy ending! But I need to gift a lucky reader of Art Bead Scene with a prize today as well. 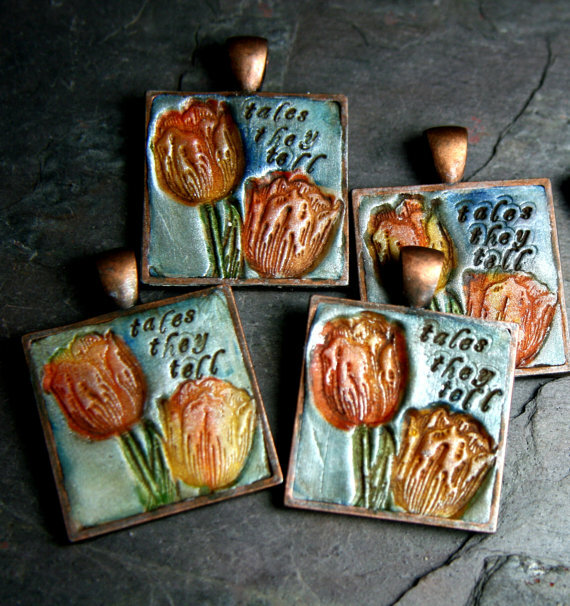 I will give away one of the 'tales they tell' tulip pendants pictured above to a random comment on this post. Every person has a tale to tell and every art bead can tell it. Which art bead artist(s) do you feel could tell YOUR tale best with their artisan components? Erin, I'm really enjoying the progressive story on your blog. It's been a lot of fun playing along with all the twists and turns. Your Simple Truths are always gorgeous and of course I'd love to be a winner. To answer your question, I can't seem to get enough of art beads and components, whether they are lampwork, polymer, or metal components. Together they help tell a story for me. But to choose just one artist....well I'm not sure I can because there are just to many. So my answer would be all of them! The progressive story is so much fun, unexpected twists and turns keep the interest going. 1. First on my list would have to be your Simple Truths pendants. Your great words of wisdom, or customizing our own special quote, for gift-giving or wearing it proudly is unique and fun when taken one step further with our own designs. 2. 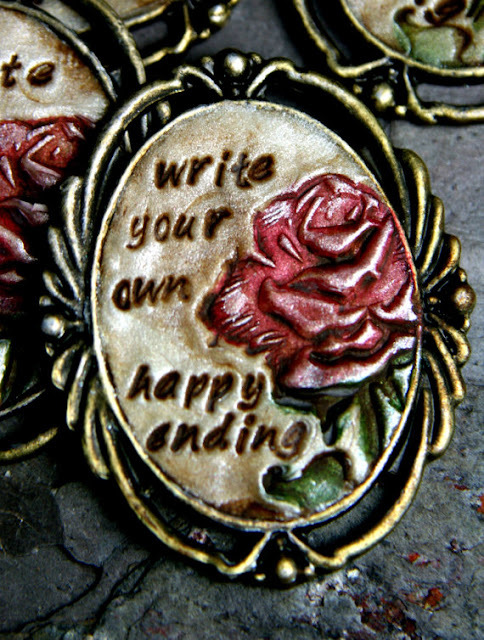 Green Girl studios with their double-sided charms create meaningful pieces. 3. Marsh Neal Studio has an abundance of designs and color choices for everyone. 4. Humble beads for fun nature themes. 5. 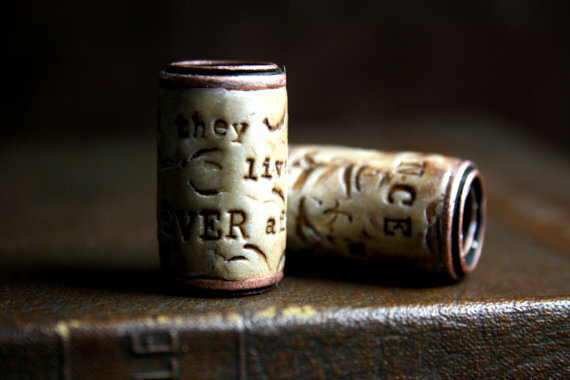 Joan Miller Porcelain has creative and whimsical pieces too. 6. Beads of Clay is an amazing group of artists. Fantastic! Great post, difficult to choose one artist that reflects my story but I'll try and narrow it down to three, Numinosity, JewelIdentity and HappyFallout, all on etsy. And all these lovely artists make beads and components that are colourful, quirky and eccentric- just like me! But it has to be said that with all the amazing bead creators, there is a bead for everyone's story. wow--tough one. Jennifer Heynen for her playful, free-spirited style. And much of the work from green girl studios speaks to me as well. To pick one that tough! I love so many artisan's work. There is something about clay that fascinates me and sparks my creativity. So I love pottery girl and spirited earth, However to tell my story, I would have to choose Stacie Lousie's bezeled sea glass. My etsy shops name is The Whispering Seas because I have been blessed to live near the water since I was five and this is where I find my sense of relaxation. In fact, my first piece of jewelry I made about 3 years ago was with sea glass. Last summer I was visiting a local sea glass show and saw this wonderful booth with gorgeous pieces. Immediately I recognized the work that I had happened upon on etsy. I ended up buying the sea glass bracelet off of Stacie's arm. Since then, I have purchased several of her components. I just finished a moon/sun necklace with one of her clay beads. It is completely different from my norm, but that's what art is all about pushing yourself to create the something new. That is a tough question to answer but I will give it a whirl! 1. I have to say your "simple truth" line! Love the designs and the words you use! and last of a long list of I want, I want, I want - 5. Kristi Bowman and her copper components - love her paisley bracelet cuff and I want to buy them all! ... the colors of my life are best espressed through Birgitta's fabulously earthy pendants @Angel Whisperer. thanks for asking us to share. Heather's beads speak to my earthy, mother nature personality, while Erin's word beads tell my story! I think the first artbeads I discovered were lampwork beads at a studio I visited on holiday, and I was fascinated by the gorgeous colours swirling through the glass. And then I found Green Girl Studios beads and created my first art bead piece, a necklace for my sister featuring an overload of Green Girl Studios beads!! She was so happy with it! And since then I've discovered so many more art bead artists, and I love them all! Now if I only had unlimited money, and time to create with them all!!! Well,first of all, your "Simple Truths" pendants could tell my story very well, and several of them already have! Then I have my favorites from Heather's Humblebeads, have to include Mary Harding and Summers Studio, too. That's the short list. Enjoyed your well-put-together post. You're a brilliant writer, you blend your various skills so beautifully. 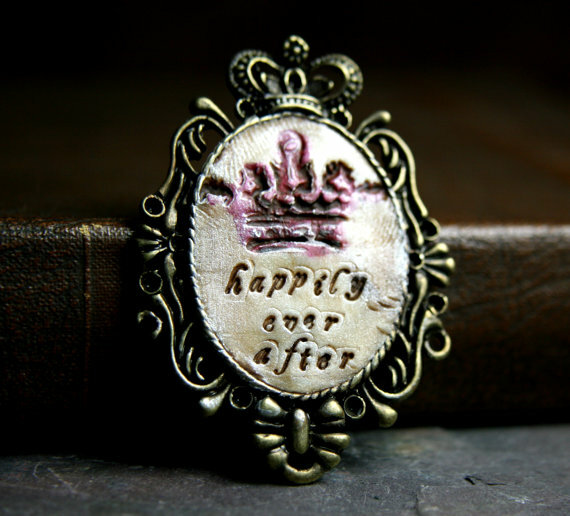 Your "Happily Ever After" pendant says it all for me when I met and married my dear hubby Walter! I also make alot of my own custom pendants and improvise. Congrats on the feature with Vintaj! The simple truth is that I have several Simple Truths pendants that really speak to me. I also love the special qualities of Humblebeads. I am enjoying the ongoing tale that's being told on your blog - such fun! Art beads? Well, I love simple truths, as you know! I love Julsbeads lampwork. I love Humblebeads. I love enameled beads, of which I am the artist! There are so many others, to many to name. I'd love to win! You can't have too many simple truths! I love anything that is earthy, organic and reminds me of nature, especially the ocean. Artists that come to mind are Staci Louise-Smith, Green Girl Studios, Humblebeads, and I love the blue-green colored metal of Melinda Orr and MissFickleMedia. I also love many lampwork beads and enameled beads :) Would love to win a Simple Truth bead, love them too! Love beads that are organic, earthy, remind me of nature and especially the ocean. Love the work of Staci Louise-Smith, Green Girl Beads, Humblebeads, Kylie Parry, Melinda Orr, and MissFickleMedia. Would love to win a Simple Truths bead, fingers crossed! I so love how the story has grown. I love Humblebeads nature inspired beads and also Mamcitia.